The fifth bi-annual D23 Expo is upon us and day two is kicking off with the The Walt Disney Studios Live-Action Films panel! As we saw yesterday with the Pixar and Walt Disney Animation Studios: The Upcoming Films panel, this one should be jam-packed with surprises from Walt Disney Pictures, Lucasfilm and Marvel Studios. That’s why we’re offering up-to-the-minute reports with a live blog of the full festivities. Follow along below! Located in Hall D23, the D23 live-action movies presentation has promised never-before-seen footage, surprise star appearances, and more. It will provide a behind-the-scenes glimpse at an exciting array of spectacular films on the horizon from three world class studios. Star Wars: The Last Jedi is written and directed by Rian Johnson (Brick, Looper) and continues the storylines introduced in Star Wars: The Force Awakens. The sequel is produced by Kathleen Kennedy and Ram Bergman and executive produced by J.J. Abrams, Jason McGatlin, and Tom Karnowski. Star Wars: The Last Jedi opens in regular and IMAX theaters on December 15, 2017. Directors Anthony and Joe Russo, meanwhile, are directing both Avengers: Infinity War and the untitled fourth film, which are being filmed back-to-back in Atlanta and are written by screenwriters Christopher Markus and Stephen McFeely. Both films will also be shot entirely with IMAX cameras. 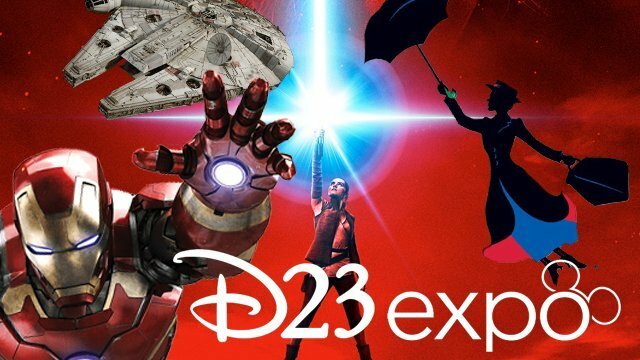 What are you most hoping to see from the D23 live-action movies panel? Which upcoming release are you most anticipating? Let us know your thoughts in the comments below.